First let's talk about the PT test. PT stands for prothrombin time. It is a measure of how quickly blood clots. The traditional method for performing a PT test is to have your blood drawn and sent to a lab. At the lab, a substance called a reagent is added to your blood. The reagent causes the blood to begin clotting. The PT result is the time in seconds that is required for the blood to clot. Numerous factors can affect your INR, so it is important that you keep your clinician up-to-date on any changes in your life. For example, you should notify your clinician before starting new prescription or non-prescription drugs, including herbal remedies. Also, you should notify your clinician of changes in your diet, exercise regimen, alcohol use, tobacco use, etc. Good communication with your clinician will help you keep your anticoagulation therapy on track. For more information about oral anticoagulation therapy, please review the About Warfarin section of our website. Earlier I mentioned that the traditional way to run a PT-INR test is to have your blood drawn and sent to a lab, where the test is conducted. Another option for obtaining an INR is to use a point-of-care device, also known as a fingerstick testing device. To use this device, you prick your finger and provide a drop of blood on a test strip. The test strip is fed into the device, and the device reports the INR. These devices typically are easy to use and report accurate results. Additionally, if an INR result is surprising, another test can be run immediately to either confirm or refute the result. These devices are often used in clinic settings to obtain INR results. Additionally, these devices can be used for home-testing by the patient. Recently, Medicare approved coverage for patient self testing for mechanical heart valve patients who meet several other criteria. 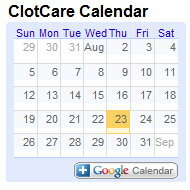 If you would like to know more about patient self testing, please review the Patient Self Testing section of ClotCare.